Mayumi Oda has devoted more than fifty years of her life to her art, and nearly as many to activism. 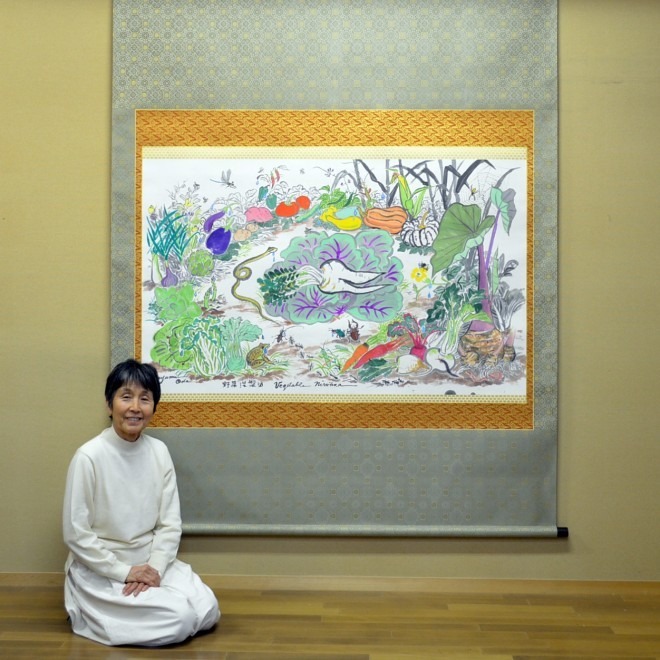 In her paintings and prints she depicts powerful goddesses in the Buddhist tradition, and her deeply feminist viewpoint also drives her ongoing efforts to promote world peace and eliminate nuclear weapons and other nuclear threats. She has lived in Japan, mainland USA, and most recently, Hawai’i. A board member of POINT Foundation, which published the Whole Earth Catalog, and an original member of the Japanese NGO Inochi, she co-founded Plutonium Free Future in 1992. In March 2012 she spoke with Alice Miyagawa about her present concerns. 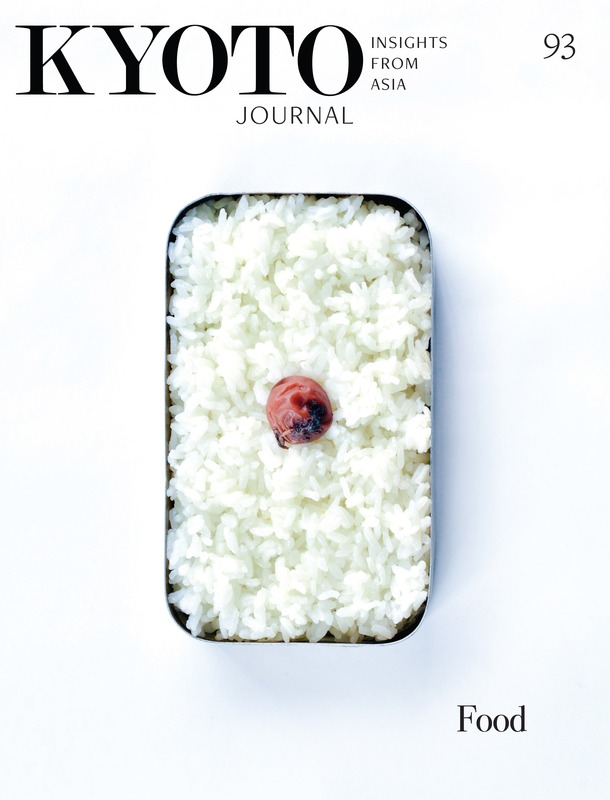 You were interviewed previously for Kyoto Journal following the Tokaimura nuclear accident in the summer of 1999, when you lived in California. You said that you had come to Japan to help empower people, especially women, in response to the government’s negligence in handling the issue. Then, at the turn of the millennium, you moved from California to Hawai’i. That seems to have marked a turning point in your life. What did Hawai’i offer that encouraged you to relocate? Until 1999 I had really tried to focus my work to let people know the dangers of having nuclear [power plants] on earthquake faults. I couldn’t convince them. I already saw the possibilities of disaster. I thought it would be in Tokai, or Hamaoka, near Tokyo. I was terribly, terribly worried. I had worked nearly nine years in the antinuclear movement. I was very discouraged that Japan was not really responding to the danger. I was just very tired, and I felt like I had to rebuild a new life. So I chose Hawai’i to do sustainable living, making a farm, to show people that there’s another way to live. I felt like somebody had to be doing this — not just thinking about the possibility, but practicing it. Hawai’i taught me to live with aloha, within an island. In 2000 I bought the farm [Ginger Hill Farm and Retreat, in Kealakekua, meaning the Path of God], and for eleven years I have worked on it. I have probably educated about two hundred young people, just to live hopefully sustainably through farming, through eating the right things, making medicines, cleansing, healing oneself with herbs and the things that we grow. 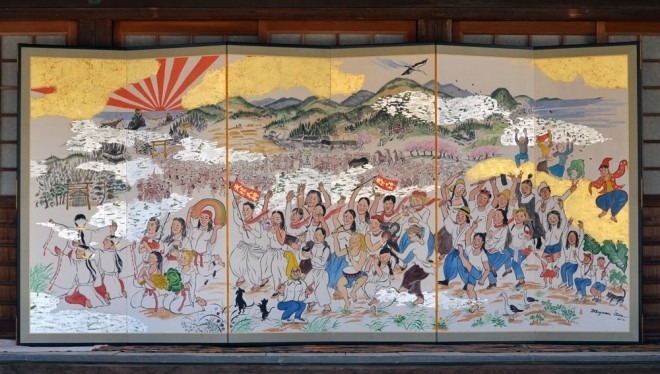 I just finished painting a six-panel screen of mostly women marching towards Amaterasu the Sun Goddess — I painted about forty women, with a few men. 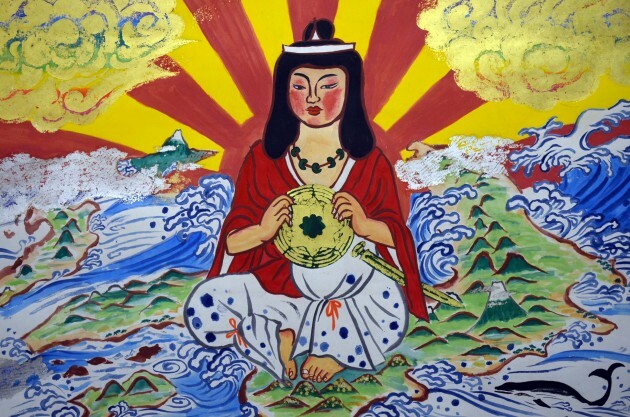 They are all practitioners of my Goddess Academy, marching from the life they lived, to a more nature-based life, symbolized by Amaterasu — marching from an oil-based economy towards a solar-based economy. So you feel it’s time to focus more on permaculture and obviously your art work as well? Yes. I haven’t really painted as much as I did last year for a long time, because I was an activist and a farmer. To start a new five-acre farm, it took almost all my energy to do that, and I came to a point where I realized that maybe I should really paint some vision that would be hopeful for the future, that maybe that’s a job for an artist to do. So I painted a Sotatsu screen of the Gods of Wind and Thunder turned into females to bring more of the feminine into culture, especially Japanese culture, which really needs more feminine. Traditional culture has it, but somehow this modern culture in Japan became so Westernized that we gave up a lot of that stuff. Sotatsu is my favourite painter. I just felt that we need some air, the wind, that we needed some shaking up. I had a pair of golden screens but I didn’t want just a sweet feminine Goddess, hitting at drums. I felt almost like the women in Fukushima all feel, and so it’s a lot of force and a strength — I felt that these Goddesses can somehow break through something that we are so up against. That’s how I painted those two Goddesses, to bring an energy of change that our country needs at this moment. After doing that, this word came to me — shinsei — new birth. From this difficulty that we’re facing, the hope, the new birth will arise and so I called the exhibition that I’m doing at the museum at Honolulu Academy “A Prayer for the New Birth of Japan” [May 24, 2012 – January 13, 2013]. These are all yamato-e style paintings, the tradition is extremely old-fashioned. It’s been going on 1,300 years in Nara so I kept that tradition. If you don’t use the brushes, the inks and colored ink-sticks, this beautiful culture will die. [Nara produces 90% of the sumi ink used for Japanese calligraphy, and is famous as the centre for Japanese brush-making.] So I decided that I will focus on this old beautiful tradition that our ancestors used, and with that how can I express who we are now in this time. In 1993 I did some hand-scrolls called Random Kindness and Senseless Acts of Beauty [for] a story that was written by Anne Herbert and Margaret Pavel, right after I became an anti-nuclear activist, so my message was very anti-nuclear, anti-war and anti-violence, and how to live with the peace of others in the land. That was the story behind it. Now it’s a nine-meter scroll. All the work that’s going to be exhibited [in Honolulu] has some significance to the work that I believe in, that I want to do — some are Zen scrolls — and it’s basically so that I can really show, without explaining, directly through the art, the messages I feel that are Amaterasu, or Earth. It’s our survival. They want to be sustained, they want to give that nourishment to the future generations. So I did this work for the younger generations that we just deprived because of our own luxury, our own wantings, our own electricity, our rich food, we really just left such a legacy to these young people. It feels to me this is an apology — I’m sorry that we did so badly. I’m dedicating this to the younger generations. When I think about it, it just makes me so sad. Our generation was so bad, especially men in my generation, [they] could not think about anybody — they were so caught up in the Japanese becoming so wealthy, so luxurious, they were just awful, awful, so wrong. With next year’s sengu, do you expect there to be a revival of this mass pilgrimage? In 2013 there will be a great deal more people going to Ise. I don’t know how many will do it on foot. Nara University has an Ise Mairi seminar and I think more than a hundred people will walk together. All the way from Nara to Ise it’s about five days. But the infrastructure needs to be revived. I think it’s great business — it’s a different kind of tourism, more ecological, more spiritual. Pilgrimage could be big business. Japanese people love walking. Do you see parallels between more traditional spiritual pilgrimages and the growing movement of political walks to bring awareness to present-day issues? For example, the sacred runs in America, for Native Rights, which include rights against uranium testing and nuclear facilities. I took part in the International Peace Pilgrimage in 2004. People walked for eight months. Four months in Australia from Roxby Downs uranium mine to other related sites, then four months in Japan from northern Honshu to Nagasaki and Hiroshima. Do you find that you are identifying more with Shinto these days, or do you still feel very based in Buddhist practice? I am a Buddhist practitioner but my heart may be more Shinto. Certain people just cannot relate to this. Japanese Buddhism has not been helpful to people for many years. Some was, but people almost have a fear about going back to practice Buddhism. I had to go to the United States to practice. It was at a time of women’s spirituality, and I felt great kinship with the women in the United States, to practice together, the quality of the feminine. A lot of people in Japan have started to practice Tibetan Buddhism. Unless there is an enormous change with Japanese Buddhism, they’re not offering much. The vows you make as a Buddhist to save all sentient beings, their practice doesn’t show this. The practice shows making money as a temple, doing funerals, making a special name for the dead. Where is engaged Buddhism? Some people are waking up and doing it, but I wish there were more. Where is their heart? What’s your hope for people in terms of spirituality? My hope is that Buddhism can offer a great practice, if they can feminize it. Do you think it’s possible for Shinto to offer this? I think Shinto is just about going to the shrine. People do that. But in Buddhism just going to visit the temple doesn’t do it — it has to be based in practice. It can be chanting the name of a certain deity, or sitting in meditation, or chanting mantras. But unless it has a little more of a feminine quality… which I think it did originally in the teachings of Kobo Daishi [Kukai], but somehow it got mingled together with the samurai tradition and the stoicism of the Japanese, and it lost that softness. When you read Zen writings, for example those of the monk Ryozan Taigu of the late Edo period, you know that they were very compassionate, soft people too… Unfortunately, the mainstream practice has become so macho, so patriarchal. Amaterasu is still associated with the patriarchy and especially Tenno (the Emperor) in our country but she is beyond that, so I painted her with the rising sun symbol, the nisshoki — hopefully we can go beyond our militarism and go back to [who] she really is and why she’s so important. Seventy years ago when I was born, a lot of people still believed in Amaterasu and there was still a lot of old-fashioned farming going on. This is just on the outskirts of Tokyo — we lived a very connected island life until even 70 years ago. So I think we have it in our genes, our DNA, that it would not be hard for us to go back to that sustainable living. I think the Japanese people are very intelligent and I think we can go back. That is really my hope, that without technology and by our willingness to be good to each other and to be helpful — you know the way that Japanese people help each other, even after this tsunami disaster, just fascinated other people all over the world — I think that with this kind of diligence and this kind of caring for each other, with all the possibilities of technological development, I really deeply feel we can do something extraordinary, to change the culture so that it’s more sustainable, solar-based. The number of people who are interested in safer energy is growing very fast, and the technology is growing fast. I think that definitely a big shift is going to happen… It was a very very difficult thing in that we lost so many people, we’re going to be losing a lot more from this experience but if we don’t turn that into something very positive and a great change, then there’s no future. What most impressed you in Japan when you visited in March 2012? When I was an anti-nuclear activist, people just did not want to hear, but the situation has changed so much, you know. Just experiencing that amazing demonstration, [“Bye Bye Genpatsu,” March 10th, Kyoto] — and that it was a different kind of demonstration — that people were dancing and singing, their way of expression felt very good. There were a lot of young people; it used to be mostly old people, very depressing, only 400 of us marching, something like that. So that was an incredible change. It was reported that 6,000 people joined that “Bye Bye Genpatsu” demonstration! Last time we spoke you said you couldn’t believe people were still living in Tokyo. Could you speak a little more about that? I haven’t been back to Tokyo yet this time. I think that people don’t want to hear about it, don’t want to deal with it, but there’s a lot of anxiety and fear in their minds. Once they deal with it, it will be so primeval, one has to go into the core, and change their complete lifestyle. Everything has to be uprooted. The people who can really make a choice will win, get out and start a new life somewhere in the country, or in other cities. Especially if they have parents in the countryside, they should go back, and start a new life. You arrived here on March 11 last year to set up a project in the countryside, right? We thought we could start a village in Morokino, and young people could go back, but it was just too complicated, probably because of the lack of help from the regional government. It’s very difficult to rent or buy land to cultivate; even if you are offered the land, it’s very expensive. I mean, there are farmhouses that are not being used, but we are probably acting a little too late, as the farmhouses are becoming dilapidated. In order to fix them, it would probably cost at least $100,000 each. I’m talking about an area about one hour from Osaka or Kyoto, villages that people are giving up on living in, but it’s still workable, and still possible to commute to the city — maybe not every day, but half a week or something like that. But we found it would be very difficult to find a local job, you almost have to create the job. I got quite good funding to do this Morokino project, but it was way too little, especially as the funding was from the United States, because of the decline in the dollar. On the other hand, in the northeast the land is so contaminated, we are not going to have enough food for Japan. It seems like the natural thing to do, to make use of all of the land in this safe area, especially to offer the land that is not being used. If the regional governments gave some kind of aid, financially, to the farmers — those who live there and the people who are going to rent it — this would make a much easier transition. At this moment it’s just almost impossible to find land that they are willing to lend. A lot of people I know want to rent it, to start, but of course it’s hard. The land is there, it’s just that we need a different policy. … meaning that we don’t have to buy vegetables from China, we can feed ourselves. Especially rice, I mean, Fukushima, Miyagi, they were big rice production areas. In terms of energy production, how do you see Japan coming through this situation, to be able to create sustainability? I think it’s very doable. Solar, wind, a lot of biomass. For instance, in Nara and Kyoto they are no longer able to utilize their lumber factories anymore. In Kitayama there is a huge amount of biomass. The timber is all just piled up! No one is building expensive wooden-framed hinoki [Japanese cypress] houses anymore. Who can afford it? So the lumber industry is declining, a lot of people are out of a job. The timber can be made into biomass. A lot of people are checking the possibilities for what can be made into biomass. Or by using the land they can grow things which can make gas. There are a lot of things that people can do. How do you see this operating in terms of communication between the public and the regional government? There’s no conversation between them. Somebody has to be the liaison, for the regional government; the voice of the people needs to be heard. I think it’s already happening. Especially in Hyogo, Shiga, Kyoto, Nara, and Mie prefectures, there are a lot of big cities, and there’s a lot of land not far from them, not even an hour away, which people aren’t using. It needs good planning — somebody’s got to do it. Since the government and the public are just not communicating yet, it requires conferences, and seminars, and the networks have to include the people who can make changes to the policies. I can see Japan’s staunchly patriarchal government shifting ever so slightly, through the example of Shiga where we now have the first existing case of a female mayor and a female governor in power simultaneously. Religion also has this patriarchal inclination. What are your thoughts on this? I think it’s time for me to really start showing that feminizing through my art, so that we can go back to that society that really cares, for the future, for life, and the children, the land, more compassionate and more loving. Patriarchy is here because fear produces enormous industrial funding, from the military to the insurance companies. Fear is a big money maker. For example the security system going through the airport, I mean, that’s just a total waste, but it makes huge money. So what I think as an artist is that there’s very little I can do, but at least I’ve been painting the Goddesses, I’ve been painting the female, I’ve painted Amaterasu. You’ve also painted so many goddesses with nature, vegetables and plants on the land. Do you think that the disaster is encouraging people to go back more to the nature-based religion of Shinto, rather than following the adopted religion of Buddhism? I think both are happening. To us Japanese, Buddhism and Shintoism are not really separate, you know, Kobo Daishi. For us, it’s all mingled together. It was during the Meiji period that they were separated, because they tried to make Shinto more important, but Buddhism gives a method of practice, to be closer to the divine within us, within your heart, called Buddha-nature, but Buddha-nature is within yourself. If your identity is one with nature, then all the Shinto Gods are the same as the Buddha — there’s no difference. There’s a definite connection between this and agricultural practice, especially in terms of ritual, for blessing the land and honoring the gods of the land. Do you see a similar thing happening in Hawaii? Yes, there’s a lot of amazing movement about the teaching of agriculture to young people, and people going back to growing their own food. It’s a strange thing that in Hawaii, a lot of the food is imported, even bananas and mangos from Mexico. There are now a lot of people growing their own food and medicine. In what ways have you explored or been influenced by Hawai’ian medicine, women’s role there in shamanic practice, the Goddess mythology of Hawai’i? It’s a part of their life. You almost don’t have to study especially, if you are acquainted with the right people, they use it in daily life. And that’s the way I was brought up, with my family using it. Now people living a very urban way of life are separated from nature, so it doesn’t come back to them. Once you live with nature, with the land, that’s part of life, it’s nothing special. If you get very sick, you just start cutting the ginger and making a tea. For the people who want to integrate themselves with the land, they have to make a conscious effort to live that way, because in normal life they’re using food which is full of chemicals and additives. Normal life is not normal anymore. Do you think that your message has a different kind of power, or force because of you being in Hawai’i? Could you do the same kind of work if you were living here in Japan? If I was living in Japan, I wouldn’t have done it. I wouldn’t have noticed the beauty of Japan, the goodness of Japan, the intelligence of Japan. But because I am in some way bicultural, I can always compare. I was fortunate enough to be educated on the East Coast, which had a real deep Ivy League intelligence. I met many different cultures, so that which I see in Japan is something so special and so wonderful. Compared to this very high Western culture in which I was based, and which I was introduced to when I was really young, I was given a very sure feeling about my own roots, as a Japanese person, and what was so good and what was so deep, about what’s so deep in me that’s so Japanese. I can always go back.